Movement for Multiparty Democracy (MMD) President Nevers Mumba has expelled his Party’s National Secretary Muhabi Lungu and his vice Chembe Nyangu with immediate effect. Speaking at a media briefing this morning Dr. Mumba said he had expelled Mr. Muhabi and Mr. Nyangu for insubordination and that it would be difficult to work with them as the party reorganises itself in the run up to the 20th January elections next year. The opposition leader said the job of the national secretary is to organise the party and that keeping the duo would not be in the best interest of the party. He said these two were insubordinate to him and accused Muhabi of using party funds to fight him despite being the person who fund raised the money for the party. He explained that the decision to fire the duo is not in anyway a way of revenge against them but to ensure that party reorganises it self to ensure that it bounces back to power and that it would be difficult for the two work with others. Mwansa Mbulakulima has since been appointed to act as National Secretary with Winnie Zalomous as his vice. The opposition leader has also revoked ten Presidential Nominations but that the party’s National Executive Committee will have to ratify all these decision. He also said the party will carry out an audit the books of the party to determine what has been happening in the last thirty days. And Dr. Mumba says he is open to the idea of working with the former President during the campaigns but that the decision should came from the former Head of State. He said Mr. Banda’s input would be welcome and that he is ready to work with him. The MMD leader has also indicated that he will this afternoon be meeting members of parliament. This is not vindictive at all. Replaceable game pieces. Play on. You have hardly finished your sentence that there will be no vindictiveness and in the same breath you are expelling people. You should have just kept quite in the first place. That’s the problem with ba Mumba – ukulandalanda. Unfortunately these are the actions that will make it very difficult for people to believe you and also to trust men of collar, they don’t walk the talk. He must get rid of those that are a danger to his party .Kaingu as well. Lungu Muhabi just lost respect from zambians . He is auditing the books of the party…..but is open to work with Banda! Keep your friends close, but your enemies closer! @Patriot Abroad – the bullhorn Shaka style approach meant assegais were immediately put to use and he wants to be frenemies with RB for strategic purpose as you’ve outlined. Virtual decaf, water or juice for you? I am double espresso today! your friend HH also has started seeing Scott as the most intelligent person, HH also has just noticed there are a number of good things Sata left behind…I wish HH told him so when was still alive my family and I would have given HH 28 votes but I promised him 1 which I still intend to give him coz I know 27 are more than enough for Edgar Lungu. The political landscape of Zambia has changed so much, thanks to the late Sata. Presidency is now for swearing in only and State House is for being bedridden when your are unwell. Opposition party leaders will now only be firing the first people in front of them while other member of the parties’ job is firing party presidents. Citizens will just have to wait for the next ‘thing’ to happen. Life is good. Nevers Mumba is at a great risk of being fire by his Central committee, watch this space. UPND is the one benefiting from this fall out within PF and MMD. Most of the times, Nevers thinks with his heart and not his brain. it is a sign of political immaturity to fail to anticipate people. If Mumba is to be a good politician he must remember the words in the Bible that the heart of man is deceitful above all things and desperately wicked. None of these men he is working with are washed of such evil hearts, whether it is the MMD Die hards, Nyangu or Muhabi or UPND’s HH. Nevers must remember that in every decision he makes, there will be opposition. To win, he must get all believers on his side. Work humbly with all churches and not just Pentecostals. THEY DESERVE IT. THE YOUNG MAN LUNGU DOES KNOW WHAT HE WEANTS LET ALONE WHAT HE NEEDS ON EARTH. ARE THESE THE YOUNG MEN WHO WANT TO RULE ZAMBIA? I AM NOT A SUPPORTER FOR NEVERS BUT THE YOUNG MAN TOGETHER WITH HIS ACCOMPLICES WERE TOO STUIPIDILY EXCITED ABOUT HIRING AND FIRING. ummmmm!!!!!!!! but pastor u said u will not fire anyone!!!!!! Then reality bit. Hard! Chuckle. But these two are party admin staff whose job is to organize the party and not fight the party bosses. If they have failed to organize the party why keep them?. The man of God has invited RB. Keeping all those who opposed him except the chief admin people. Even in politics there is morality. Keep it up Nervous. yes, F Mutati will go back to his party because he is in a wrong flight HH which is about to crush in a few seconds. Maybe he could have suspended them. MMD has just fired a Lungu, we can’t wait for the other Lungu in PF to be fired. Looks like wherever there is a Lungu, there is confusion and a hint of lack adherence to the Law. Umh? pastor you should have reconciled . He treated Muhabi Lungu well but Lungu betrayed him and fought him, He is right to fire Lungu , that is not vindictive , its the right hinges to do. Never leave an enemy behind, he will rise against you. So kaMuhabi very soon you will hear that nika secretary fimo fimo mu UPND. No – you cannot reconcile with Muhabi- Ask KK? Muhabi was KK ‘s personal aid. What happened? The man loves those who have failed out of political landscape. He thought he could use money raised by NM for his secretariat to strengthen his political ambitions. He single handedly recalled RB to come and take over. No- reconciling with Muhabi is fine but that does not mean leaving him to be SG. That’s a brilliant move they embarrassed you.Now Mr president my question is, how many mps out of the 37 are under your command? My advise is that continue working with the progressive MPs; i personally like the idea of a forming a government of national unity where MPs will not be required to cross floors but working together to avoid bye elections. i would suggest that UPND and MMD consolidates this partnership. Mutati and Situmbeko are good MPs. also i suggest that MMD meet Magande as a possible endorser of the UPND. God cannot declare a jubilee for nothing i believe history is in the making. he whom God wants to eliminate, he makes mad first like Nebuchadnezzar. Sin comes with its own rewards. It’s the sin that made Nebs mad rather than God. It destroys the soul. Better to resist always. In fact, it would not be wise to bludgeon your MPs into supporting your candidature at gun-point or ship out. It will further weaken the fragile ship you are steering. Rather you need a sober approach – to discuss with mutual respect. You must understand that they are adults who can’t just jump from point to point overnight. They are mature People who took a stance after long, thoughtful considerations. You need to earn their trust and loyalty. Allow them room to adjust. Very pleased for you Nevers. Work even harder for the grand prize. May the best man/party win! Oh no Jess… You mean…He inherits the Grand Mufti?!? Chuckle. Glad to see we won’t have to learn what that actually means! We have Mr Mumba’s grand mufti to thank, for preserving his sanity during these trying times. There’s nothing more comforting than cuddling up to your grand mufti while you await Rupiah next scheme the next morning! The best for Dr Mumba is to back HH and get VP position once they win. They should also have a loose alliance which should see him run as presidential candidate on the UPND/MMD ticket once HH exhausts his two terms. Dr Mumba,Sir, being HH running mate and consequently VP for the country is better than being in the opposition be-wilderness all the time……what with all the infighting within the Party, you never know what will be next, these people will continue setting traps for you. Mumba has more experience than HH. Why would he plum for a VP role? It should be the other way round! Mumba has more MPs so why cant HH be his vice instead.? UPND chaps will never accept reality. UPND has a lot of bloggers and most of them do not vote. Times are-a-changing. In my opinion the UPND lot have had a good clear run and have been a lot politer than the PF and MMD massive were a couple of years ago. The big two have dropped off hard and texts fly across the world. Zed is mobile territory and fertile ground. Perhaps all bloggers should keep their families debating and not act like we will be Fred Flintstone like forever. Chuckle. I think that is why he wants to work with him…….in some strange sort of work relationship. He won’t be able to turn his back on Banda…grow some eyes on his back…! Banda is popular where? At least not in Lusaka and CB. I have heard people talk about HH, Nawakwi but not RB. RB comes in as a swear word. RB do not be cheated very few people talk about you winning seriously. Nevers has done you a good favor from embarrassment of losing another elections. At least now you will say – asembe ninawina. You are completely barking mad! Lungu is approved by all PF MPs, it is Scott who is going to get his come uppance after Monday. Guy has lost respect and his MPs DO NOT WANT HIM! Read the mood it’s an open fact. Good decision,you cant work with indiscipline people. Nevers Mumba is ok by firing those two easterners and hiring the Northeners.Good indeed and now he should taste the bitter waters we shall see which Mps he will work with.MMD is finished its not an appendix of PF.An less Banda is not a seasoned politician ,he will not a gree to work with a small boy who has disgressed him ,whose aim is to auction the party to PF.A party that is fighting Rupia Banda.RB has the keys to state house the one he will chose to work with either HH or Lungu will have it.wacth the game. I meant to say, MMD is now an appendix of PF. Weldone, let these opportunists find formal employment they stat paying tax.bwezani is not wise either, rather let go. Wait a minute Pastor,Much as I understand the precarious situation Muhabi has created for you, I need to remind you what you earlier said. You said earlier on that there will be no vindictiveness. It now seems that the same hand that extended the palm branch of reconciliation to those who had offended also wielded a hidden sword of vengeance. Doesn’t vengeance belong to the Lord, preacher? If the Lord fought for you to reclaim what was almost stolen from you, wouldn’t it be right to let him deal with your oppressors? Muhabi could have resigned on his own without you saying anything. I think you acted too soon sir. Now you make him less guilty than he really should have been. Suggestion: Should you fail to win the presidency, like Peter who denied Christ, go back to Getsemane and reload. Nanga MMD ni Chipani cha nyoko? I’m very happy with the turn of events.Muhabi acted without shame,showing elements of tribalism. Why is it that only MP’s from our area spoke loudly about RB’s comeback.Why were other MP’s quiet with the exception of Kaingu whose relationship with NEVERS we all know.He played bad politics.If really there was need to chose another candidate,why didly he advertise so that even me Mkandansenga Daka could have applied.Who told him that RB is more popular than me,he should have find out in RUFUNSA-Chimusanya village how popular I’m. @ realist, since when did RB become a popular candidate? I thought the man suffered the worst and most embarrassing defeat to Mr Sata in the last elections. Mr Banda was the incumbent President then with all sorts of Government resources at his disposal but still lost. Honestly, do people expect that if RB runs as president this time around there will be a change of luck? The chances are close to zero. Dr. Mumba does need troops that can follow his command. However, with him at the helm, I doubt MMD would win this election and especially if they go it alone. They have to make a choice of what party they can work along with. The nation rightly quoted Ba Mumba as saying there will be no any vindictiveness. Show them who the Bwana is.They thought you’re toothless.This is the time to engage Banda now and use him to win for you and send him in Diplomatic mission probably in Zimbabwe.lol. Zambian politics and judicial system is utter insane in all its form. Too much democracy sometimes is not good and Zambia is a very good example of that. 50 years of so called independence and total tranquility, can’t even afford to treat your own Presidents let alone heart transplant, cancer etc. All you know is South Africa hospitals. Why can’t we invest in our health system? Mandela was being cared right in South Africa. Unlike in Zambia, everything is politicised from diplomats, to Permanent Secretaries, Media, Govermnent contracts, all unpatriotic to say the least. Outcome an engineered failed state. Mumba has acted correctly. A Leader must chop off destructive elements, and should not foist political enemies into the Party. Banda is a no no! There has to be trust in the group and discipline. Members must use correct progression channels and seek approval from their peers. I bet Bowman, is on a hunting party! His tight handshake with Muhabi during the court hearing has turned into fists. I pity Muhabi Lungu for his naked greed and failed coup. Who is ever going to trust him in political circles? Oh look how the Mighty fall Muhabi! Muhabi Lungu is such a loser. When is he going to be part of a winning team? Dr Mumba, this is the way to go continue being decisive and to the point. We need true leadership in this country and not stone throwing style of RB. Do what they say but do not do what they do. They do not do what they preach, says the Bible. A swift turn of things indeed…….. from not persecuting to persecuting. Anyway he is a human being. What has happened to Muhabi Lungu is a lesson to Kalaba & others, it can also happen to you. Humble yourselves before people and you will be lifted up. Ok so using our new law of the suspended by the suspendee who was expelled but now a suspender. Will muhabi become a suspendee or can he fight back to be a suspender? Yaba mutu wa baba wee!! The same will prevail with PF right thru to 20th Jan 2015 for a smooth transition. I pity Muhabi, he always supports or works for losing would be leaders..i.e KK, FX Nkhoma & RB…I suppose ts coz they wer all UNIP chaps. Lungu and Chembe had it coming. They should have resigned on their own yesterday. They had been very unprofessional in their conduct. Their conduct had been mercenary, immoral and unethical. They deserve what has happened to them. Well done Dr Mumba. We are behind you. But can Nevers win an election? I doubt…ok let us see what happens. I’m a girl. I like flowers and rainbows and sunshine and sweet munkoyo. I hate unfairness and mean people. So Nevers getting rid of these 2 makes me a very happy girl again. why will vote for DR Mumba, is has quality to be a President, Viva Pastor, Zambians who are wise will vote for Dr. Nevers Mumba!!!! It looks like some people have difficulties with understanding and interpreting even the simplest of things. Nevers Mumba said that he will not be vindictive to those that suspended him. And so far he has not been vindictive – he has done only what is right. What he has done is just, and application of justice and order. If your employer says I will not be vindictive to anyone, then you decide to slap him just to see what he will do – you will be fired; not because of vindictiveness but because of your indiscipline. You don’t misbehave just because you have found a good man – because all he will do is to announce your firing, and actually you have simply fired your self. Putting burglar bars on the door after thieves break in is not vindictiveness, come on!! I appreciate your write – up. It is logical, sensible, succinct, and very humorous – all ingredients of intelligent writing! Can someone remind me which party Mumba ever led to victory in elections? Which Member of Parliament has ever been elected representing a party led by Mumba, except those who were recontesting seat they held before Mumba? Nevers’ chance is in 2016, maybe. Go Go Pastor we are behind you, all serious christians it is now time to vote for a Man of God!! !, only devil worshipers will vote otherwise. Lishamu ilya shani ili ba MMD? 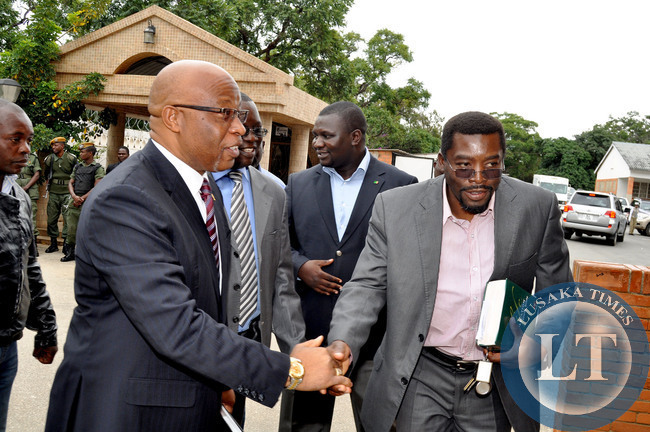 Nevers Mumba presidential candidate for MMD? Yesterday the majority of us members of MMD and who wanted an RB comeback became sick. We are not voting on MMD at all because with Nevers it would be a waste of time and votes. MMD is now dead and buried forever. So PF and UPND, we are there for your picking, just convince us why we should vote for you. Nevers is excited. Please don’t make MMD a katemba party. This is the biggest party in Zambia but by the way you are behaving Mr. Mumba you will have a shell of a party by the end of these elections in 2015. Take it easy and if you can go on a retreat after you lose on January 20th. Your firing of Lungu and your planned firing of more NEC members will only make MMD your katemba party. You will destroy this great party just like you destroyed Reform party and National Citizens Coalition. You appear to have a knack for burying parties. I can assure you that after January 20th, especially after you lose miserably the party will be on its downward spiral. Take it easy! Firing two easterners at a goal is sending a wrong signal! You still need Eastern province! spare my ribs my brother!